Hoge Kempen Rural - Industrial Transition Landscape is part of the Tentative list of Belgium in order to qualify for inclusion in the World Heritage List. The last week of february it feeled like spring in The Netherlands. That was for me a good opportunity to visit Hoge Kempen National Parc. For me it was “only” 2.5 hours driving from home. There are 6 locations to enter the parc. I choose for Mechelse Heide and Connecterra. At 10.30 AM I arrived at the little parking Mechelse Heide, I thought I am the only one there, but the opposite was true, the parking was almost full. A lot of people where hiking and cycling in the surroundings. I decided to hike with my parents the most simple trail, the blue route. 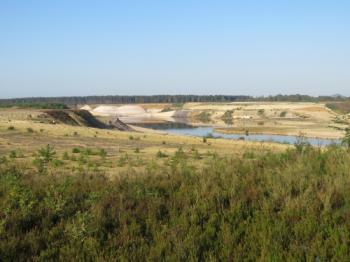 After the pleasant hike I drove 6 km north to the site Connecterra where the visitor center is from the Hoge Kempen. Very close to the entrance of Connecterra there is a huge shopping place (Maasmechelen Village). Els wrote about it in the the review below. I came also not for shopping, but with a parking place of more then 1600 parkings, it was no problem to park my car at noon. And there are public and clean toilets in de shopping street. I walked in 5 minuts to the entrance of the new visitor center Connecterra. I paid the fee of 3 euro. You can get (buy) hike maps or books and pay the fee and thats it. There is also a terrace. I expected more inside the building. For example a very little exhibition about the history and background of the parc. But I came for the parc , and again I decided to hike the most simple trail, the blue route. After an hour or so when I came back by the entrance I was satisfied with the two locations I visited and at 2.30 PM I drove back home to The Netherlands. Belgium is currently preparing the 2019 nomination for Hoge Kempen Rural - Industrial Transition Landscape. This is going to be proposed as a mixed site ánd evolutionary cultural landscape. It covers the Hoge Kempen National Park plus .. more. To me it’s unclear which locations will comprise the core zone, but additionally to the park the garden cities of Winterslag, Waterschei, Zwartberg and Eisden seem to be included. The core zone will be centred around Maasmechelen, a municipality of 37,000 inhabitants known for its coalmining history. Maasmechelen nowadays also is well-known even across the border in the Netherlands for its Outlet Shopping Center (attracting over 2 million people a year): ‘Maasmechelen Village’ was constructed on the grounds of the former mine of Eisden. I did not come to shop obviously, but to get a grasp of this potential WHS. 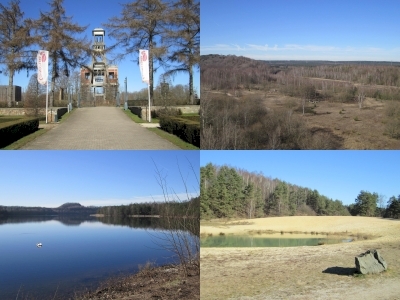 For its natural values I prepared a visit to Hoge Kempen National Park. The park only exists since 2006, and commercial exploitation seems to be a big issue here too. There are 6 designated access points to the park, but most have been spiced up to include attractions such as dog parks, miniature golf courts or a planetarium. I eventually choose the ‘Mechelse Heide’. This is mostly heathland, where a few easy hiking trails have been laid out. I walked the 5.5km long blue route, which has distant views on a former sand and gravel quarry. The site’s natural value is geological: here you can find river sediments of the last Ice Ages – sand, gravel, pebbles. This is said to be the best-kept example of glacial formation effects from that period in Europe. I cannot really say that my hike brought me closer to seeing, let alone understanding, this. There’s no interpretation along the trail, and most of it goes through a rather nondescript forest. I was even less successful at another access point, Station As. Here I followed a short trail that should reach the wall of a former gravel quarry where you can see the different deposits since the Ice Age. No “wall” was found by me however! It’s a long story getting from the natural circumstances to the cultural landscape, which is the other pillar of this proposed WHS. Due to the sand and gravel, the agricultural value of this area was poor and it was mostly used for keeping cows and sheep. However, coal was discovered in the ground and the area was quickly turned around into an industrial economic system. This system came with changes in the landscape (slag heaps etc), migration from other parts of Europe and specific facilities such as housing for the miners. It even became the subject of 19th-century, Western European landscape painting (a favourite spot for plein air painting). This broad scope is reflected in the proposed criteria for inscription, and I can already see IUCN and ICOMOS lamenting about the lack of focus. On my way back home I drove via the garden quarter of Eisden, considered to be the most beautiful example of the Garden City concept on the European continent. This is not exactly a neighbourhood with homes for poor miners’ families. Spacious villas and public buildings were constructed in a leafy suburb. They’re now often converted into restaurants (and even a casino), or are in private use so that it felt a bit awkward to stop the car and take photos. There are a number of pretty buildings though, such as the huge ‘mining cathedral’, the parish house, the school and the house of a mining engineer.